The biggest money in this world will ALWAYS be made by those who know how to play the energy markets. The problem is, 99.9% of media pundits, market analysts, money managers, and investment advisors will never be able to help you win big at this game. Unlike Dr. Kent Moors, they don't have access to the inner circle of power players who control the world's energy. So they're always late getting into the real, fast-moving money plays that only a handful of people in the world can see coming. The truth is, there's a very small number of true movers and shakers in the energy world. Just some 50-odd people control 90% of the world's energy markets. The power they wield is immense. Each one of them has Kent on speed dial. And end up a millionaire many times over, in very short order. As one of the world's most highly sought-after consultants, Kent's clients include six of the world's top 10 oil companies, 20 world governments, and high-ranking representatives from OPEC, the IEA, and EIA, and our own National Intelligence Community. Of course, Kent's Energy Inner Circle recommendations are only known to a select few. I bow before you! I took your recommendation and bought Massey starting with one account buying 200 shares. Had other cash become available and on 2/23 bought another 1,995 shares. The returns were between 13.21 and 22.84% for a total profit of $17,114.35. The fact is, Steve is just one of the thousands of readers who have consistently banked big gains since joining Energy Inner Circle. We hear from them all the time. “Your recommendation on Goodrich Petroleum was the best. Purchased on April 9th at $16.90 and sold half on April 23rd at $26.70 for a 58% profit or an annualized profit of 1512%. And now is your chance to join them. In fact, it's never been easier to become a member. 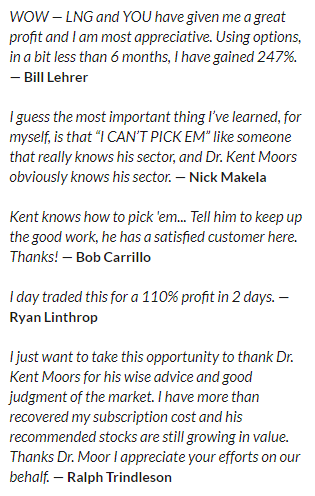 Just click here to receive all of Kent's Energy Inner Circle recommendations. What you get with a subscription to Energy Inner Circle! Most people don't know this, but I have my own “inner circle.” It includes all of my most avid subscribers. To give average investors the chance to change their lives with the “inside” information my Rolodex of contacts regularly provides. It's called deep access. And it is what has put hundreds of companies on my “Trigger List” of stocks to buy, producing phenomenal results. I'm talking about dozens of exceptional short-term wins like 99%, 160%, 244%, 352% – even 542% in just 19 days. These are real-world examples from among the 88 double- and triple-digit wins I've led my readers to since 2011. 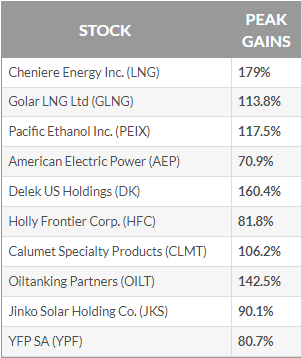 Last year alone, for instance, the Energy Inner Circle posted a stunning 83% win ratio – with an average return of over 50% per pick. But access to my “inner circle” is extremely limited. It has to be. Size: Many of the businesses I recommend to Energy Inner Circle members are highly focused enterprises. Typically, that means they're smaller too, and therefore not suitable for wider release. Speed: The unusually high growth rates associated with smaller firms require a faster response. So it's important to use the Energy Inner Circle's “real-time” structure to deliver the recommendations. Frequency: The quicker pace results in a strategy that more closely resembles “trading” than “investing.” And a greater focus on the short-term allows us to move in and out of more opportunities – a level of activity beyond our strategic growth strategy at Energy Advantage. Leverage: When the upside potential is both big and imminent, I'll recommend a call option on the underlying shares. This can produce a dramatic effect – like a 542% gain, in the case of Westport Innovations Inc. (NASDAQGS:WPRT). Access: The Energy Inner Circle is a smaller group by nature. Access alone is a benefit. And we protect it. And looking back on what my contacts have made me privy to in just the last few months, it's mind-boggling to imagine how much money Energy Inner Circle members are going to make this year. Rest assured… when something big happens in the world of energy, my readers know about it before anyone else – they have the information at their fingertips to profit fast and early. For as long as I have been in this business, I couldn't possibly be more optimistic than I am right now. The investment opportunities I'm investigating have never been this good. Massive opportunities as the shale oil boom goes global. The game-changing emergence of the liquefied natural gas export market. The developing “micro-booms” as more and more oil gets shipped by rail. Major advancements in energy technology. New MLP “clones” that kick off incredible income streams. You can get insanely rich. The whole key to making money in this market is being able to see the genuine changes just before everyone else does. Bottom line: I know the most important people in the industry – the world's biggest buyers and sellers of energy – and the policymakers who make the rules. The off-shoot is almost inconceivable profits. Of course, the kinds of recommendations I regularly share with members of Energy Inner Circle are only known to a select few. It's called inside access, and you won't be able to get this type of information anywhere else on earth. Any one of the opportunities I disclose could make you enough money to retire early on. Urgent Action Alerts – Sent directly to your inbox so you act on them quickly, these alerts will give you my exact recommendations (including specific “buy” and “sell” instructions) for making money in the energy markets, wherever the opportunities are. Weekly Market Updates – Every week, you'll get my summary of where the global energy markets are now, and where they're headed, plus my insights on emerging shifts and trends in energy you could play for triple-digit short-term wins… or longer-term scores of as much as 10, 15, even 20 times your money or more. Special Research Reports – Released periodically as I write them, these cover especially timely or relevant big-picture themes in the world of energy. Things like new energy trading techniques, emerging trends, or entirely new investment classes. 24/7 Web Resource Access – Your unique password is the key to accessing all of my past and current Action Alerts, plus my Weekly Updates, Special Research Reports, recommendations, FAQs, Reader's Forum, and more. When the big dogs of the energy industry want to induce global technological and political “super-shifts” in the market, they go straight to the one man on Earth with the experience, connections, and know-how to make it happen: Dr. Kent Moors. Go here for immediate access to Energy Inner Circle. Go here for immediate access to the Energy Inner Circle portfolio. Go here for immediate access to Energy Inner Circle trade alerts. Go here for immediate access to the Energy Inner Circle research reports. To see how you can get immediate access to Energy Inner Circle and all its features, click here.